I grew up in Canada and trying to figure out the American health insurance system is something that’s been a huge challenge for me. I remember getting my first “real” job at a big Fortune 500 software company and being emailed a ton of forms to fill out for health insurance. I had no idea what any of it meant. Unfortunately, there wasn’t really anyone who could guide me through the process. No one in the human resources department wanted to be advise me because of that delicate line between “advising” and “choosing”. It was so very frustrating for me as I felt totally blind. If someone had asked me what my plan deductible was or what my yearly out of pocket maximum was, I would have been clueless. It wasn’t because I didn’t have the brains to figure it out. It was because the process was so broken and the information was so inaccessible that I just gave up out of impatience and total frustration. Each plan had it’s own brochure or PDF with tiny fonts and crazy charts and tables filled with insurance and legal jargon. Over the decade or so that I’ve been responsible for my own American health insurance, I feel like I finally have a better understanding of the key things to look for in plans. However, after having at least 6 different health insurance companies throughout 3 different jobs, I can attest to the fact that they are all broken. All the information is hard to understand. All the communications are done in formats that are inaccessible and poorly designed. And each time I had to call a health insurance company with a question, I felt like they were reading answers crafted from their legal department rather that listening to me as a person and giving me a personal response. The customer experience of health insurance company is awful. No wonder so many people don’t have health insurance or don’t understand the insurance they do have. I have a college degree and even I find myself questioning my coverage and wondering if I’m getting scammed. A few years ago when the Affordable Care Act started to come to life, I wrote an article called EnrollUX 2013: Designing A Better Health Insurance Enrollment. The article talked about how the California HealthCare Foundation enlisted the help of IDEO to design a proposed new system to help guide millions of people through the process of signing up for health insurance. I’m still wondering if anyone over at healthcare.gov ever heard about this and how that whole rollout had the outcome that it did. I’ve been searching for health insurance for about a year. I’ve been covered through a COBRA plan that I opted-into after leaving a startup I was previously at. I looked into health insurance through the Freelancer’s Union, but I honestly had a really bad experience trying to sign up with them. Apparently they were completely swamped with requests when I was trying to sign up. But as a consumer I still felt a bit blind — I didn’t understand the forms I was filling out, I had trouble getting answers, and the entire process had a lot of friction in it. So, I decided to stop my enrollment process and just keep paying my high COBRA premiums because I knew it would not expire until September 2014. Over the last 6 months or so I’ve heard so much about Oscar health insurance. Finally, I decided to check them out and at least get a quote. I honestly hadn’t read any of the press they’d received, such as this New York Times article. And me only exposure to them had been through seeing a tweet every now and then from people. The first time I went to the Oscar website site, I really felt like I could trust them. The site is very simple, easy to navigate, and uses language that normal people use. I didn’t feel like they were trying to cover their asses and put their best interest before mine. Within about 3 minutes on the site, I was able to get a quote that was easy to understand because it was presented in a simple, elegant, well designed layout. From that point, I was able to identify the 3 plans that I knew fit my budget. Next, I had to narrow down which plan made sense for me. Someone from Oscar emailed me and I was able to ask them some questions that I couldn’t find answers to such as whether or not the 3 plans covered things like acupuncture or physical therapy. I also wanted to double check the yearly out of pocket maximums with the Oscar representative. Even though they are clearly listed on the website, I just wanted to be 10,000% sure because that number is so important to me. God forbid anything bad happen to me, I didn’t want to be stuck with a $20,000 out of pocket maximum bill because I didn’t understand something in the plan. The Oscar representative assured me that I understood the out of pocket maximum correctly. When I was ready to sign up, the Oscar representative called me and the entire process was complete in 11 minutes. I tweeted this and a few people said that the whole “sign up on the phone” part turned them off. But, I completely disagree. If Oscar had sent me forms that I had to fill out, it would have taken far longer than 11 minutes for me to fill out the information. Also, putting the burden of filling out the forms on me adds the risk that I do it incorrectly, or that I don’t have the right software to fill in the forms, or that I have to print the form and scan it back it and email or fax it to Oscar. I completely see why Oscar does sign up over the phone. As well, it allowed me to ask the representative any final last minute questions. Health insurance isn’t something that anyone really gets excited about. But, I am so excited to have Oscar as my health insurance. I think they have nailed the customer experience so far and I really love their focus on helping me live a healthy life. I feel like they really want to go the extra mile to encourage me and make sure that I don’t need their services in the first place. For example, they offer partial gym reimbursements as well as a doctor on call so you can ask questions and decide if you really need to schedule an appointment or go to the ER. As far as cost, it ended up being cheaper than my COBRA coverage and has a lower deductible. I can also pay my bill by setting up automatic payments from my bank account. When I had COBRA I had to mail in a physical check and include a little paper “voucher” that they sent me. It was so inefficient and was so time consuming! It is so great to see people reinvent such an important part of our lives. 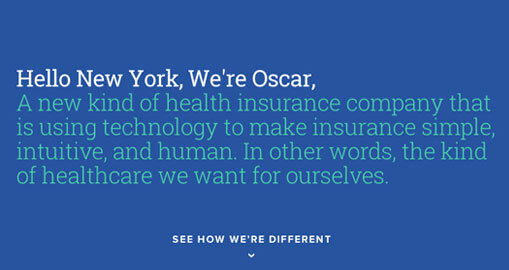 I’m really curious to see how Oscar health insurance grows in the coming months and years. It’s so refreshing to know that if I need their services I won’t run into any surprises and that they truly care about my health. PS: My coverage doesn’t actually start until March 1, so I haven’t even received my insurance card yet (which I imagine will be a lot more useful and well designed than the hard to read and flimsy ones that other companies mail out).